With the Silhouette Cameo 3 being released with some features that are comparable to the Cricut Explore, one might ask, which is better, the Cricut Explore or the Silhouette Cameo 3? Both are very popular machines, though they do have some key differences. The Silhouette Cameo 3 (as of 2016), is the newest die cut machine by Silhouette. It’s not as strong as the Cricut Explore but is able to cut most paper, vinyl, and standard fabric materials just fine. Even though the largest cutting mat is 12″ x 24″, the Cameo 3 can cut lined media up to 10 feet long without a cutting mat. Similar to the Cricut Explore Air, the new Cameo 3 has dual carriages, so you can print and cut without stopping the machine to swap out the blade or pen. The machine is also blue-tooth enabled as well, allowing users to cut wirelessly. Other features of the Cameo 3 are the PixScan technology. This technology allows users take pictures with their camera or smartphone and send them to the Cameo. Another feature is the Scan and Cut. The Scan and Cut feature allows users to print designs from their printer and have the Cameo cut them out. What is really neat about the Silhouette Cameo, is that you can purchase the Autoblade, which is a blade that automatically adjusts its length based on the material being cut. A big factor in users choosing the Silhouette Cameo is the Silhouette Studio Designer. The Studio software is powerful software that allows users to either buy, import, or create their own designs from scratch. If you have graphics experience, then you will love the freedom that comes with this software. If you aren’t as computer savvy, there may be a small learning curve, but there are lots of materials, online groups, and free videos you can find to help you learn. The Cricut Explore Air is another popular die cut machine on the market. 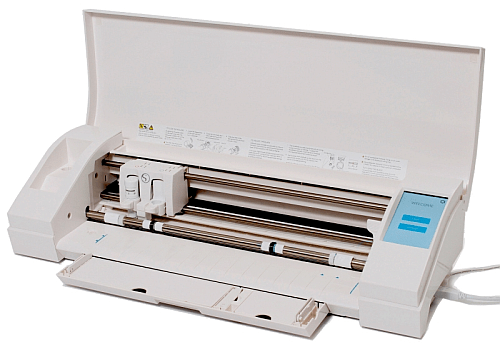 It’s easier to use compared to the Silhouette 3, and can cut and draw up to 12 inches by 24 inches. Similarly to the Cameo 3, the Cricut comes with dual carriages, so you can draw and cut with a single pass without having to stop to swap out the pen or blade. The Cricut is also Bluetooth and Ipad compatible (Ipad 2/Ipad Mini and newer), so you can cut wirelessly. The Cricut also has a Print and Cut feature, so you can print images from your printer and have the Cricut machine cut them out. There are two factors that make the Cricut Explore easy to use. The first factor is the Smart Set Dial. The Smart Set Dial is a knob on the outside of the machine that allows users to easily adjust blade depth and pressure according to the material being cut. For special material or cuts, there is also a custom option to change the depth and pressure to a specific setting. Another factor that makes the Cricut Explore easy to use is the Design Space Software. 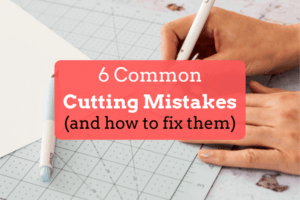 Design Space is beginner friendly, so users who aren’t as tech savy will have a better time with the Cricut software. The Design Space Software is an online software, so you will need a good internet connection to use the machine. Unfortunately, you won’t be able to use the Cricut machine without an internet connection. With Design Space, you won’t be able to create advanced designs from scratch, but you are able to import svg files for free. 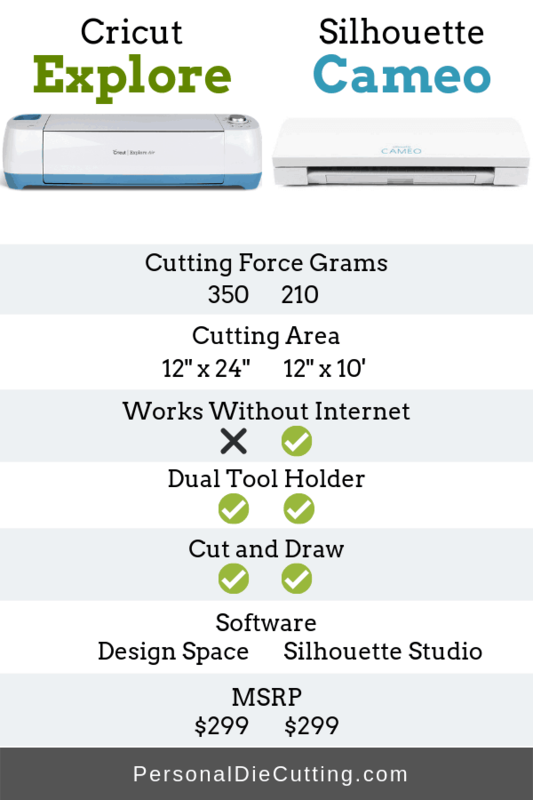 Below you can compare the differences between the Silhouette Cameo 3 and the Cricut Explore Air, and find out which is best for you. What machine is stronger, the Silhouette Cameo or the Cricut Explore? While both machines have pros and cons, when it comes to strength, the Cricut Explore is stronger than the Silhouette Cameo. The Cricut Explore isn’t considered a heavy duty cutting machine like the Cricut Maker, but it can cut more materials than the Silhouette Cameo. The Cricut Explore comes with a German carbide blade, making the blades last longer. Deep cut blades are available for both machines. It should be noted that the Silhouette Cameo can cut some of these materials, but not at the thickness that was tested. For example, you can cut magnet using the Silhouette Cameo, but you need to use Silhouette’s magnetic paper. One of the big differences between the Silhouette Cameo and the Cricut Explore is the software that the two machines use. The Silhouette Design Studio is far more powerful and advanced than the Cricut Design Space. The Silhouette software allows users complete freedom to create their own designs from scratch. The images that can be purchased are also more professional looking, rather than the simple, clip-art looking designs from the Cricut store. There is more of a learning curve with the Silhouette software compared to the Cricut software. The basic edition of the Silhouette software is free, which allows users to use jpg, bmp, and png files. If you want to us svg files, you must upgrade the software for $50. The Cricut Design Space software is easier and more simple to use compared to the Silhouette Design Studio software. This is good for users who want to create simple designs and won’t be creating designs from scratch. You can create designs from scratch using the Cricut software, but options are very limited. The Cricut Design Space was designed for importing existing designs created in other programs into the Cricut software. One important difference to know is that the Cricut Design Space requires an internet connection and that projects and linked cartridges are stored in the cloud. Compatible file types for the Cricut Software are .svg, .png, .dxf, .gif, .bmp and .jpg. Which is better, the Silhouette Cameo or Cricut Explore? When it comes to the Silhouette Cameo vs Cricut Explore and deciding which one is better, it all depends on your needs. If you want a die cut machine that is easy to use that isn’t complicated, consider the Cricut Explore. The Cricut is stronger than the Cameo, but the Design Space Software requires an internet connection and isn’t as powerful for creating designs from scratch. If you want more freedom to create your own shapes, consider getting the Silhouette Cameo cutting machine. The software is powerful, but the downside is that the Cameo cutting force is limited to 210 grams of force, so you won’t be able to cut as many materials as the Cricut. You will also need to upgrade the software to be able to import .svg files. What machine do you think is best? The Silhouette Cameo or Cricut Explore? Leave us a comment! I LOVE my Explore, though I do wish the capability of cutting without internet were available. For me that’s the only downfall as compared to the Cameo. I wouldn’t leave Cricut for that because I fully expect that to be a program release in the not too distant future. unfortunately I bought explore without fully evaluate the software – They do need your internet to sell all the images and by all means to prevent the user cut with their own design – don’t expect them to change the business model. Can you upload your own designs made on Photoshop? I love the depth of the cuts for the Explore but love the software and designs on the Silhouette. I end up using the cameo the majority of the time as the software and designs are much better. I’m torn! I have the Explorer and Cameo 3. I love the why the Explorer cuts and how quiet and easy to use it is but Silhouettes software is light years ahead of Cricuts. I wish they would merge and just make the software compatible with Cricut and not require Internet to use, then we’d be talking! Love the Explorer but need the Silhouette software!! I make designs in Indesign or Photoshop and can make jpg, gif, png or bmp. I will not use software from the cutter. Is the cricut an option? Can I use an ipad for the silhouette cameo 3 or do I need a laptop/pc? I’m looking to make shirts with sayings and such. Which would be best for thaf? Definetly the Cameo. I have both and that’s the one I use! Good luck! How dense were the products that the cricut cut? And thanks for the article. I’m choosing between these 2 right now. I’m trying to make a decision between these two machines. I use Adobe Photoshop and Illustrator to design. Would the Cricut Explore Air be the best choice? I am so torn. Hi Cindy. I too use Illustrator to design. Where you able to choose a machine that works best for you? Hi Cindy, I also work with Illustrator and have a Cameo. I LOVE the Silhouette extension to send files to the machine straight from Illustrator. I think you have to pay for it though. I’ve had it for so long, I can’t remember if I pay for it. I am torn too. If you can design and upload then why is the software an issue? Its not really an issue other than you have to have internet connection to upload and print/cut. I use Design Space to design simple items as well. On a few occasions (like two days before Christmas), the website that hosts Design Space will slow to a crawl because of the high volume of people finishing up gifts. Some of that could be the Internet being slow too (lots of people in my neighborhood were streaming Netflix movies and stuff – so I noticed internet slowness too). If your internet connection is poor, then you might feel frustrated. I use SCAL4 to do most designs on my PC and then use DS to upload and cut – which addresses most of the traffic issues. Other than that – I have had no issues. They’ve upgraded design space. It’s still in beta but there’s no more lag like there was in the previous version. There is still lots of lag as of 7/14/2018. When it is a holiday, like father’s day i couldnt get my cricut to even load. it kept saying error.. The software is just not a good one for designing. We are looking to add a machine to our high school Family and Consumer Sciences department. Which would be more student friendly to use if mostly used for bulletin board letters, shapes for child development lessons, etc.? Hi Teresa, if you have internet, I would recommend the Cricut Explore, as it is easier to use. Hello! I am looking for a machine to make vinyl signs for my husbands dealership. Which machine do you suggest? I plan on using our logo too. Thanks in advance for any suggestions or help! Hi Stephanie, I would go with the Cricut Explore Air. It cuts better. I cut vinyl with the Silhouette Cameo all the time and it works wonderfully. I’ve never had a problem. It’s a tie for cutting vinyl. I am looking at making vinyl cuts outs for monograms and company logo and such and vinyl stencils for glass etching. Does the Cameo 3 not cut vinyl as well as the original silhouette? The Explore saves projects on internet. Where are projects saved with the silhouette? I live in Canada. I have android products which i know you can’t use with cricut. Can you use android with Silhouette? Having a hard time deciding which machine would be best. Silhouette stores on your computer. Thierry designs download to the cloud, but you can move them to your computer, if you do choose. The lady who purchased was a hoarder and never used it. Could not get it to work finally threw it out. Which one is better for uploading your own images? I want to make stencils and vinyl stickers. Silhouette definitely if you make your own designs. The software is very graphically strong! It was mentioned that the Silhouette could handle 10-foot-long material (lined? ), but there was no such mention for the Cricut. Would the 10-foot material include vinyl for making boat names to put on the stern of a boat? So long as the vinyl comes on a liner you don’t need a mat to cut on the Silhouette. I believe the Cricut requires a mat for all cutting. Yes, the 10ft refers to vinyl. It’s great as there are few limitations in that! I make cards and the thing I don’t like about Explore is that you can’t make a card 8.5 x 5×5 because the software is browser based. If you upload a scan and print card on more than one page it is very difficult to get things the right size to put together. Easier to print off a PDF and cut out by hand. I’m thinking the silhouette might be better for cards. I live in a rural area & have no home internet, have to use phone hot spots. This being said, would the Cameo be the better option for me? Yes. I love my Cameo. I had a Cricut. Gave it away. Same… without internet the Cricut is just a paperwieght. The silhouette you can travel with and cut anywhere with your laptop and machine – no internet needed. I gave my cricut away and love my cameo. Esp. if you want to design and modify images – good software. I am thankful that I found this website……I need a machine that can cut vinyl and thin material for etching and masking. At this point I cant justify a regular vinyl plotter. I truly cannot believe that you need to be a slave to a company ( cricut ) to use their machine. I was 3 hours from purchasing their system…..looks like the Cameo will be my choice because off the offline ability. all the cartridges I purchased which is quite a few,are no good to me anymore since they were put into my gypsy. I knew that when I purchased it, but didn’t know that they would be obsolete. I refuse to buy another cricut product because I refuse to spend anymore with them.you can find some used Gypsy’s but I would still have to buy carts tonuse it. My daughter has a sillouette & loves it so I’m going that route. Contact cricut about the cartridges on your gypsy. They will link them to your Design Spce account for you so that you don’t lose them. They had me send a list and within a few minutes they had them linked on my account. I started out with a Cricut Explore but b cause of the problems that I had and the unreliability of the server connection and continuous glitches after updates, I purchased a Cameo. Fast forward two years. The Explore hasn’t been touched again and I have added an ADDITIONAL Cameo so I can actually run two machines at a time when I am really busy! I love, love, LOVE my Cameos. The software is like comparing a Corvette to a Volkswagen bug. The Cricut being the bug. I WISH I had done my homework better before buying the Explore. I was more into buying into the hype. Just because it works great for some, does not mean it works great for all. Now I have an expensive dust collector. Do LOTS of research before purchasing! Did you ever find a Cricut Explore to purchase? I have a Cricut Expression that I am thinking of selling. Did you ever sell your expression??? Did you sell it yet ??? Post to EBAY and sell it. I am considering purchasing a cameo but I only have an iPad 2 would this be suitable with the cameo . 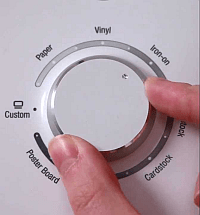 I did notice in the comparison with the Cricut that the cameo does not need Internet , what would you be able to do with the machine without this . I own the Cricut Expression and an Air 2. I also own the original Cameo, Cameo 2 (not the most current version) and a Portrait. My Cricut is not being used but I really do believe it is the best machine but the software is horrible, even with the beta. My original Cameo was the worse machine I have owned (and I had a Robocraft before it). They replaced it a few times and each machine was worse than the original.They were never able to get it to work and personally, I felt they really didn’t care. I purchased a Portrait and Cameo 2 bundle and the Cameo 2 is still in the box. I love my Portrait – never had a problem with it!! The silhouette software (Designer ED to use SVG’s) is wonderful and a powerhouse. The Silhouette store is pretty good but if you will need Disney or branded items, u might want to look at what Cricut offers and how you can use those licenses. The internet is not necessary to use the Cameo, but you can copy/import anything you need from it.You can save to your hard drive and open from there or copy and paste – your preference. Pay careful attention to what materials you might need currently and in the near future as the Cameo is not a very powerful machine (but is excellent for cards and vinyl). Banners would be better on the Cameo as Cricut is limited to 24 inches/ 2 ft. Be careful with Sport Teams as they have everything copyrighted. Cricut is awesome with Disney but I am not sure if you can use it professionally but should be ok for items for the children. Don’t be fearful of Cameo’s software as there are a lot of youtubes, groups and classes you can take. I wouldn’t count on any help from Silhouette, but hopefully you won’t wouldn’t need it. You can check out this site for further info on using the Cameo – http://www.silhouetteschoolblog.com/ . The software really isn’t difficult, just read up on it and watch a few videos and you will be just fine. Cricut also has groups and videos – youtube is awesome for both machines. I have used the Design Space for Cricut and am not impressed. Yes, it does some things for you, but once you move past being a newbie,you will need to use a 3rd party software to design with. Thee are good packages available from reasonable to very expensive. With Cameo chances are for what you have stated that you would only need the Designer edition which can be purchased for approx $40. There is a professional version for $200, but it really is for commercial or serious home businesses. Always keep in mind the best machine is the one that will do what you need and you will be comfortable with. Both machines are on sale constantly and can be purchased for $329-$349 on sale almost weekly. Michaels has the Cricut at $349 everyday pricing and the Cameo is on sale quite often. Joann’s and Amazon run sales and Amazon changes prices often to stay competitive. HSN is the king of bundles so always check there. The other stores will have freebies sometimes or a special bundle, but usually HSN wins out for the bundles. Online shops also have specials from time to time. This may be too late to assist you, but hopefully it might help someone else. Have fun! Did you end up picking a machine? I want one for the same purposes and wonder what your take on it is? Be careful regarding copyright. Disney and some sports teams take copyright violations very seriously. If you’re an educator, fair use guidelines will not protect you in this case. I’m still trying to decide which one is best for me. I already have a very old Cricut Expression and I vowed never to spend any money with Provocraft after the legal action they took against SCAL. However, I’m impressed b the range of materials that the Air can cut but I have now been told that the Cameo etches glass. Does anyone have any know,edge if this? I’m torn between which one of these two machines to buy. I currently use an ancient Cricut Expression and several years ago vowed never to let Provocraft have another penny of my hard earned cash after the legal action taken against SCAL. however, I’m impressed by the strength of the Air and was leaning towards that she to I heard that the Cameo can etch glass? Does anyone have an know,edge of how this is done? Hello, I am really torn on which one to get, I want to be able to play with designs and add and take things away. Which would you recommend to do that? Thanks for your help. Cameo’s store and subscriptions will allow you to play as much as your heart desires. Cricut has a store but it isn’t as well stocked, but it has Disney. From time to time Silhouette has had branded artwork also (Batman, Strawberry Shortcake, Care Bears, Wonder Woman are currently available.). Silhouette also has artwork from crafting industry giants such as Echo Park and Lori Whitlock (among others). The subscription there is tiered and you can purchase as little as you want or a huge package. Cricut has a few options also, but not as much. You purchase what you want with Silhouette but Cricut will allow you to design (try) before you buy. You can check out both shops before you purchase a machine and I would suggest you do and also try both software’s. Cameo is a full package design deal while Cricut’s offering is more limited. Both machines are good so ultimately the best one is the one which will do what you want and that you will be comfortable with. Hopefully you aren’t in a rush and can take time to experience both. These are the beginner machines (and the most popular), but there are several others available if your needs go beyond the capabilities of these two. I have a question….I am about to purchase a machine just cant decided which one will work best because I have never used any of them. I am a planner and will mostly use to print, design and cut downloaded designs. Please help from those whom are experienced. I would love to design shirts but that is not in the plans for now. Mostly cut card stock and normal sticker labels. Advice anyone? I will use my computer (laptop) to download and will definitely need Bluetooth just like my printer. I have a Cricut Explore and lately been frustrated w difficulty creating words from letters. I understand negative spacing and welding, but just can’t get a right font etc. my big complaint is customer support. I like to talk w a perso, and that’s 8 to 8 m-F only…when I’m working. Online chat appears to overseas and I don’t think they’ve used the machines before. Thinking of investing in Cameo 3. Does anyone know how their support is? I am trying to decide between the two. I have a MacBook Air. Will either machine work with my computer? I have used both machines with my Macbook Air. Im trying to decide which machine would be best for me. I also have a MacBook Air. I am looking to do things for my classroom. I am not sure which one would be easiest and easiest to learn. I am looking at both the Cricut and Silhouette. I thought one of them can cut lightweight metal, is that true? Hi folks, I think I’m almost sold on the Cameo purely for the freedom in designing stuff. However just wanted to know will it cut out stencils on lightweight plastic? I need it for painting furniture etc and not sure what thickness it would achieve. Also would it cut foam or felt for Christmas decorations? Thanks! I’ve cut stencil plastic with no problems on my Cameo. so, if I understand correctly, Cameo you need to purchase software to create svg files and Explore air 2 you can convert for free? is the correct? Hi Tamie, with Cameo free software you are allowed to import/open svg files and modify them. Or create your own designs from scratch, but you are not allowed to save the files as SVG. The Silhouette Studio software for $50 does not allow you to save svg files either. Sorry Tamy, I was wrong. With Silhouette free software you cannot open/save SVG files. You have to buy an upgrade to open them and another upgrade (Business Edition) to be able to save SVG files. Hi, What is machine the best for make my own design ? such as : Letter,number and cartoon. and can cut felt, sticker, and paper. I want to make my project. The Silhouette software is better for creating your own designs, but you have to pay extra for software upgrades. This is such a dilemma for me. I am so new to this whole aspect of craft but the concept amazes me. I was about to get the cameo then read a couple more comparisons like this and now its swaying me to the cricut. I signed up to the cricut design space to play about and its slightly frustrating but I think I could get used to it. I want to cut vinyl for mugs, glasses, balloons etc and possibly cut heat transfers for t shirts. Which is best for me? Does the Cricut software allow the user to SAVE a file with SVG extension? I’m a little late to the Silhouette Cameo (3) and the Cricut Explore Air 2 party. I’m not super tech savvy. I have a cheapy Asus laptop. I’m a scrapbooker/card maker (no intentions of needing to cut anything other than cardstock type paper). I almost just walked into the store and was gonna grab whatever one they had in stock but decided I’d see if I could find some pros and cons and helpful info first. Thanks in advance for any info you may offer! I am a designer and currently have a Cricut expression that I use with sure cuts a lot (very old version). I want a new cutter as I would like to be able to print out something from my computer and have it cut out precisely. I currently design all my stuff in adobe illustrator and just print with svg files. If I get the new Cricut can I use the software the same where I just import my own svg files and if so how much does this software cost? Do you recommend I get the silhouette cutter instead? I’m so torn. I definitely would buy a a Silhouette Cameo if what you are doing is vinyl or cardstock. Best software to work with. Did any of you know that whatever graphic you find online can be brought into your software by simply copying and pasting into Silhouette software. Remember copyright laws.,,it should be free & there are thousands! Imagine using ANY font to cut! You will need their extension which you can buy cheaper on Amazon. I would never give up my creativity for a Cricut which seems to go out of their way to charge you to use their lack luster designs. Silhouette allows you the endless ability to design & redesign anything! I’ve read many of the comments and reviews and I’m still not sure which one would best suit my needs. I’m a teacher and would be using cardstock, vinyl and many other types of paper to create decorations for my classroom. I would also use vinyl to create many other things . What would you recommend? Want to try creating vinyl stencil on wood which is the best machine to start with open to any tips and suggestions. I am trying to choose between these two for a Christmas present. I have never used either before or had any experience with anything like this. I’m a beginner. I don’t want to make very detailed designs or start from scratch. Just simple designs but on many different materials. Which one is best for me? Hi Annie, I would suggest the Cricut Explore. The Explore machine is more simple to use and can work with more materials than the Silhouette Cameo. Good luck! I’m thinking of buying a cricut explore or Silhouette Air for making cake toppers which would you suggest for me to get if I just want to make the toppers only ? Hi Wency, it all depends. Both Cameo and Cricut can cut cake toppers. 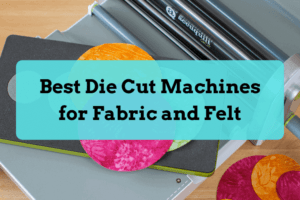 I would say it comes down to other things like what material you’ll be cutting and what machine you think you’ll feel more comfortable using. It looks like you are keeping up with comments – Good On You! Do either of these accept files from outside their software? Like CAD files… If not, are there others you know about? Yes, both machines (and pretty much all die cutting machines) accept files created in 3rd party software. Cricut Design Space accepts .jpg, .gif, .png, .bmp, .svg, .dxf files. So if you feel more comfortable creating designs in photoshop or CAD for example, you can still use them and import the file into the native software. Great article. I have previously owned a Cricut Explore and later a Cricut Explore 2 but the thing that’s always bugged me is that as good as it is at cutting, I’ve never managed to get a good, reliable print and cut out of it. We do a lot of stickers for people and I cannot get an accurate cut around the design with the Cricut. There is also the limitation of print and cut size with the Cricut (which I know has improved in a recent software update). This has led me to look at the Cameo as an alternative. My mother in law has the Silhouette Curio which I’ve borrowed a few times and that uses the same software as the Cameo. Quite like it to be honest, but must admit the Silhouette machines definitely feel cheap compared to Cricut. Anyone else have any issues with print and cut not lining up correctly? Which is best If you dont have an IPad or use if you use Android? Hi Jalane, both the Cricut and Silhouette have apps for Andriod. However, they are more limited than the desktop versions. I don’t know too much about the Andropid app for Silhouette, but based on the reviews (https://play.google.com/store/apps/details?id=com.aspexsoftware.silhouettestudio&hl=en_US), it doesn’t seem very good. You would be a lot better off using the Cricut app (https://play.google.com/store/apps/details?id=com.cricut.designspace). I have a n original silhouette cameo with designer software, & I LOVE it, Am in the market to buy another cutting machine. I can create and use sag files.. hence my question. Can I import those files to the circuit explore air 2? I’m looking to have theist of both worlds… I would love to have circuits ability to be able to cut more types of media. I am trying to decide between the silhouette and the cricut.. I am looking to make shirts as well as magnetic decals for cars. Which one would do both? Hi Tiffany, I recommend the Cricut over the Cameo if having the software online isn’t a problem for you. The siloutte only cuts 12 x 10 opposed to the cricket 12 x 24? Is that accurate? Hi Charles, the Silhouette cuts 12 inches by 10 feet long. The Cricut cuts 12 inches by 24 inches. The Silhouette can cut a lot longer. Hello…Im trying to decided which machine to buy and I’m confused about the design space. For both machines I have to make a purchase for the design space? And ive heard for the cricut that people always have to pay money to use certain designs or even things they had previously made in the free trial? Im looking into a machine that will print things for shirts, birthday centerpieces etc. I understand the cricut is the better cutter but I dont have money to be buying all designs that I need to print out. I would appreciate your thoughts. Hi Kassandra, Design Space is free software. When you purchase the machine, you get a free trial to Cricut Access, which is basically a subscription service to use special designs. Once the free trial expires, you won’t be able to use those special designs anymore unless you pay. But even if you don’t pay, you can still use Cricut Design Space for free. Hope that makes sense!